Summary: Learn how the Blatchington Mill School in the United Kingdom used Microsoft SharePoint Server 2010 to give parents access to data about their children, including attendance, homework, behavior, progress, and assessments/reports. The article describes the overall technical solution, and describes the functional design that was implemented to provide the required level of reporting. Blatchington Mill School is a secondary school in Hove, on the south coast of the United Kingdom. The school serves 1800 students who are between 11–18 years old. In addition, it has a teaching and support staff of 300. The school has used Microsoft SharePoint Products since 2005, and a priority has always been to keep parents involved in their child’s education. Mark Leighton, Assistant Head Teacher and ICT Director, worked closely with Capita SIMS to engage parents by giving them access to real time data about their child, including attendance, homework, behavior, progress and assessments/reports. As a result, the school registered more than 3,500 parents, which brought the number of Active Directory Domain Services (AD DS) accounts to almost 5,500. Blatchington Mill School is recognized as a leader for its work to engage parents, and is featured in many articles and journals, including a video for the Microsoft United Kingdom Education website. The school is also a prominent mentor school in the Innovative Schools Initiative that is sponsored by Microsoft. This article describes the overall technical solution that Sue Barnard (Systems Manager at Blatchington Mill School) implemented, and the functional design that Mark Leighton implemented to provide the required level of reporting. The Blatchington Mill School IT environment includes dedicated server hardware for a small server-farm deployment of Microsoft SharePoint Server 2010. The farm is integrated with several other technologies in the environments. The Microsoft SharePoint Server 2010 environment consists of two tiers — a web tier and a database tier. The first tier is a front-end web server that hosts the Central Administration components and handles all other farm-related tasks, including delivering content to users. The second tier is a separate SQL Server database server that manages the storage of the web application content that is contained in multiple databases. Complementing the design is a streaming media server that delivers live or recorded audio and video content, a Management Information Server that helps surface live student data, and a Microsoft Exchange Server 2010 server that integrates mail, calendaring, and contacts via the web or mobile device. In addition, the school uses Microsoft Forefront Threat Management Gateway server for its firewall, which helps ensure secure and authenticated access only to the SharePoint deployment. Hosts digital audio and video content; known in school as the "EduTube." Several SharePoint administrative and service accounts were created in AD DS to perform specific roles or tasks in the SharePoint environment. Application pool identities vary according to function, but include the farm administrator, the designated SharePoint service account, and the local service account. 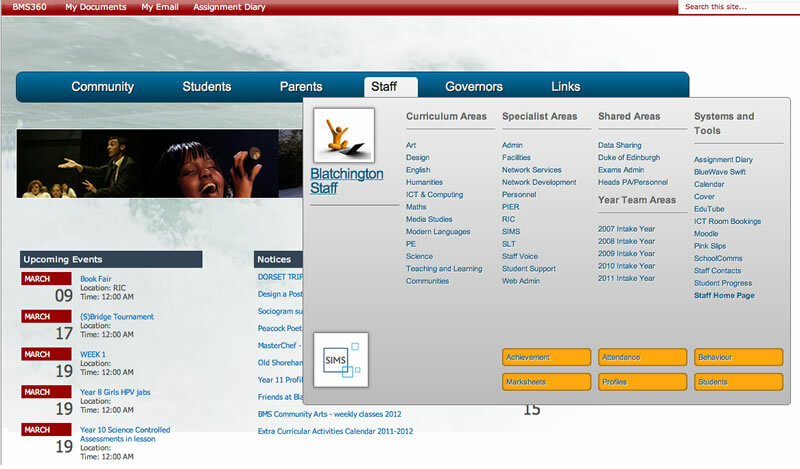 Each separate portal site is contained in individual site collections on the School Sites web application. The data for each main site collection is stored in separate content databases. The following illustration clarifies the details. My Sites are currently available only to the staff. There are plans to offer these to students very soon, and possibly to use them for student / parent / staff collaboration, or that students can use to build a personal portfolio during their life at the school. The remaining site categories are discussed later in this article. Intranet zone. Internal access is provided through the Intranet zone via Integrated Windows (NTLM) authentication. Default zone. The default zone is also configured to use Integrated Windows (NTLM) authentication. However, authentication using Windows accounts for remote access is made possible by configuring single sign-on (SSO) on the Microsoft Threat Management Gateway (TMG) Server. The TMG Server is configured to use forms-based authentication to collect Windows credentials. A recent change to the e-mail system enables users to specify credentials one time via SSO to access all services, including SharePoint sites and e-mail. A Secure Sockets Layer (SSL) certificate is installed on the TMG server and the web servers. Blatchington Mill School currently has content that is stored across approximately 20 databases. There is one database per school site collection, and there are standard profile, social, search, admin, web analytics, and logging databases. In addition, there is a custom Student Tracking database that is used to present color-coded progress checks to various audiences (more about that later). The largest content database contains the student portal site. It is currently 95 GB. The Blatchington Mill School has a virtualised test environment that emulates the setup of its main site, BMS 360. The test environment has two virtual Microsoft Hyper-V servers, one web tier and one database tier. The SharePoint installation is patched to the same level as BMS 360 (SP1 and June 2010 CU) and imitates the live environment as closely as possible. It is hosted in the same domain, which enables connectivity with the Management Information Systems (MIS), and profile synchronization with AD DS. The result is a perfect test environment for the school’s own development team who use Microsoft Visual Studio 2010 to develop, debug, and release their own Web Parts ready for deployment on BMS 360. The integrated debugging and deployment tools that are incorporated into Visual Studio 2010 provide a streamlined interface for these processes. SharePoint 2010 incorporates a very powerful and flexible Search service. Blatchington Mill School has configured the basic Search functionality and intends to fine tune it to take advantage of some of the advanced features that are available. Blatchington Mill School targets each of its core audiences with a separate site. Each of the sites links users to relevant school resources and other data. Web Parts are installed on each portal site to expose data from the school Management Information System (MIS) as appropriate for each audience. The home page is common to all visitors and contains targeted events, notices, and a summary of the online homework diary for teachers, students and parents. The page is branded in Blatchington Mill School colors, a Silverlight animation of rippling water as a banner, and extensive drop-down menus that enable users to reach most sites with one click. There is also a banner of rotating photos across the page, depicting recent events in the school. The staff site is for all teaching and non-teaching staff in the school. Each site in the staff portal is configured with permissions for a specific target user. For example, some department sites are restricted to the staff of that department only. The site restrictions ensure that the contents on the site can be accessed by staff members only, and are therefore used appropriately. Sites for each curriculum area and year team in the school. Teachers use the subsites to store resources and materials that were originally stored on a shared network drive. Sites for each non-teaching department in the school, such as Network Services, Finance, and Facilities Management. A site that hosts educational video clips. Document libraries that contain school policies, data analysis, bulletins, staff contact lists, and links to other tools and facilities for the staff. 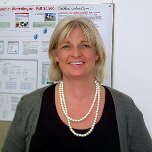 Collaborative sites for specific projects. The following screen shot displays the drop-down menu for the staff site. 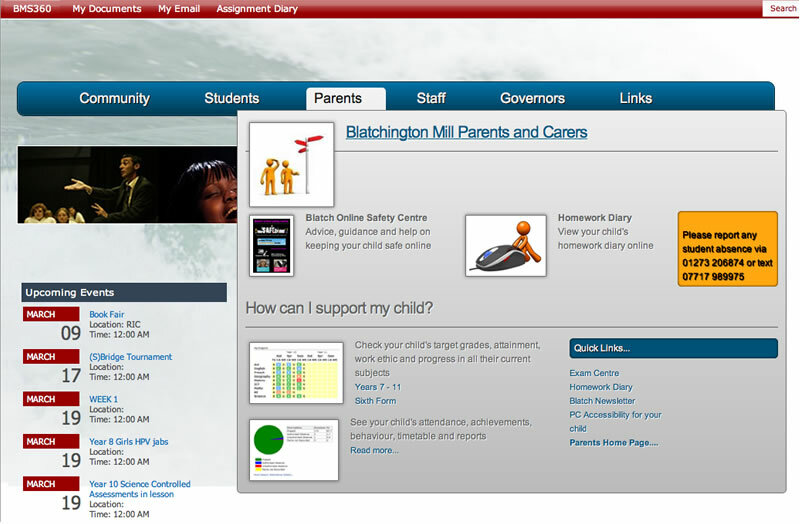 The student site is the online home for Blatchington Mill School students. It is where they access their subject materials, school information, and view their "My Profile," a set of pages that displays their personal profile information, attendance, performance, and progress data. The student portal provides the gateway to Moodle, which houses their class sites and individual class lessons, materials, and activities. Students are members of their Year Page, a site that is for students of the same grade or year level. An Options site is specifically targeted for Year 9 students to help them decide which options classes to enroll in. The following screen shot displays the drop-down menu for the student site. The student site is created, supported, and updated by the larger educational community at Blatchington Mill School. In addition to the students, all teaching and non-teaching staff, parents, and governors of the school can access the student site. The parent site can be accessed by parents only. To access the site, parents must register by requesting a user name and password. Their child’s homework diary, including tasks set, due dates, and links to the associated materials and resources. A site that provides parental guidance on how to support students at home. The following screen shot shows the drop-down menu for parents. Document libraries include school policies, newsletters, and other information that is important to parents. The parent feedback forum is moderated by the Blatchington Mill School Network Services staff. The key to providing the wealth of sensitive data to parents is securing the integrity of the data. The surfacing of static MIS data is handled by Capita’s underlying branded web service configuration. The school’s own developments use Microsoft web services to securely publish data. Parental logins are issued on a one-to-one basis, following a series of security checks by the Network Services Team. Every person who is considered to have parental responsibility of a student in school and to have no court order against them can apply for a login. 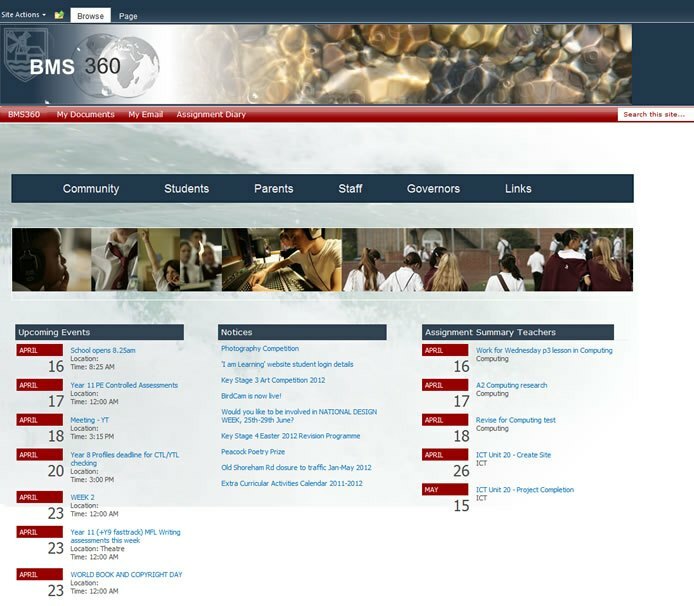 The Community site on BMS 360 gives students a place to interact and collaborate with external organizations, institutions, and people. After projects are set up on the site, they can be accessed by all project members for the life of the project. Visitors can get a clear idea of the large collaborations between different groups around the school. Three years ago, the school installed a bird box with a webcam in a "wildlife quad" on the site. For the last two years, live footage is streamed, with audio, of the nesting birds and fledglings to the school community and beyond. The content is delivered via SharePoint Server, using Microsoft Windows Media Services, and then out through the Microsoft Threat Management Gateway firewall to enable the school community to watch developments from home over the weekends and holidays. A second box was added this year that provides color daytime footage and infra-red nighttime footage. Much of the reporting services that are provided by the school through SharePoint 2010 require some provisioning of users in AD DS. For example, users are linked in MIS with our AD DS records. Parent accounts are in AD DS where they can be pulled through to SharePoint 2010 as group members so parents can access their child’s details in SharePoint 2010. This is accomplished through a series of scripts, some from third parties and some internal. These scripts are scheduled to run every night to keep both systems in synch. By storing data in unused attributes in AD DS, key data can quickly and effectively be accessed for users when they log in to SharePoint 2010. The data is displayed through custom Web Parts, such as the Online Behavior Web Part. For Web Part displays that require access to a significant amount of data, a custom SQL Server database is stored on the server. This database is populated regularly by scheduled scripts that access data from the MIS server. Blatchington Mill School developed the Online Behavior Web Part for students, and it is available from the school. The Web Part links rewards points that are issued to students by teachers through the MIS system to a graphic display on the individual student’s home page. Negative behavior points can also be displayed in the Web Part. The Web Part provides a motivating incentive to students, who continually compare points achieved. The Blatchington Mill School has a working and successful online homework diary that is the single most-requested utility by parents. Teachers write homework tasks online, and then those tasks are distributed to the homework diary of each student, where the student’s parents can also access the information. The homework diary is installed in the separate sites for staff, students, and parents, and a targeted summary Web Part is displayed on the top-level home page. For monitoring and reporting ease, the staff site homework diary also provides filtering by teacher, subject, and year group. Class data is extracted automatically from the MIS and made available to the Web Parts. The school developed the online homework diary as a series of Web Parts that are available from the school. The SIMS Learning Gateway is a discrete site collection. It houses all pages and Web Parts that the Capita SIMS (MIS) system provides. The site surfaces data from SIMS.net for staff, students, and parents. In addition, a growing number of staff members from external agencies that serve the students, such as career advisors, have access to student data. Capita SIMS SLG2 Web Parts are installed on target portals. Information that is displayed through each Web Part can vary depending on the user’s role. Lists the children of the parent who is logged in to the site. Parents use the list to view information about a specific child. Search for a student and access student information. Search for a member of the staff. Extracts target and attainment data that is associated with the selected student. Staff can also add new data. Class registration occurs online, and the MIS system is automatically updated. The Web Part displays information about registration and individual lesson attendance immediately, although each has a slightly different link to access the details. For lesson attendance, the Web Part displays a lesson-by-lesson, real-time attendance grid for the current week. Parents often check their child’s lesson attendance during the day from work. This Web Part displays all entries to the summary Behavior Management module in SIMS. Parents can view a log of disciplinary action for their child, and also a log of rewards for achievements. Both kinds of behavior carry points, which feed into the online rewards system on the site. 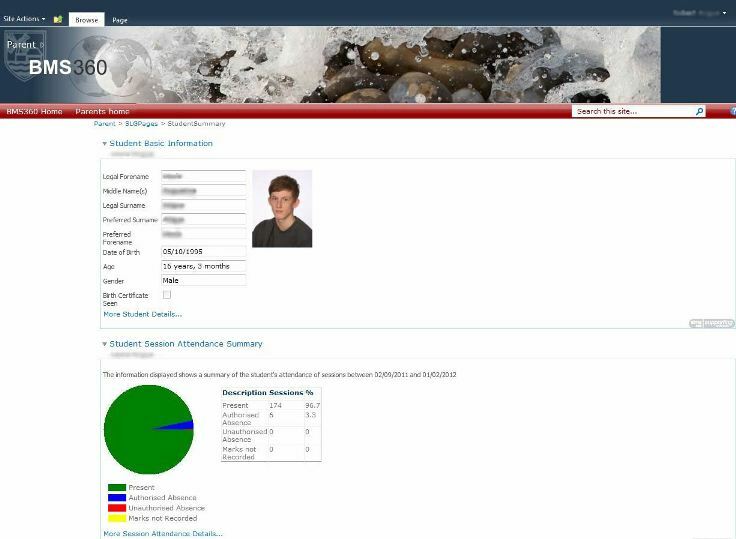 Reports full student profiles from SIMS Profiles. The following images show samples of reporting data that is available to parents. A central focus for the Blatchington Mill School is to determine how best to use its data. The school tries to share data with students and parents in a way that makes sense to them, gives them the ability to draw valid conclusions from the data, and then elicits effective action from them in response. Although the MIS provides a wealth of data, its own set of Web Parts does not necessarily display the data required, or display it in the way that is desired. When this is the case, the school develops its own Web Parts. The Student Tracking Suite is a good example. The suite contains a set of Web Parts for staff, students, and parents, about each of the three key stages in the school. Each Web Part provides summary grades for each subject that the student follows. Specifically, an end of KeyStage target grade, target grades at the end of each term, attainment grades at the end of each term, and work ethic grades at the end of each term. Teachers submit attainment and work ethic grades online each term. Attainment is automatically color coded to indicate progress towards the student’s ultimate target grade. The information is always available for students and parents to see, and is a very popular feature of BMS 360 for students. Parents can now chart their child’s progress at any time across several years. Teachers can engage in more detailed conversations at parent conferences, parents can make better decisions about which teachers to see. Students are much better informed about their progress across all of their studies. 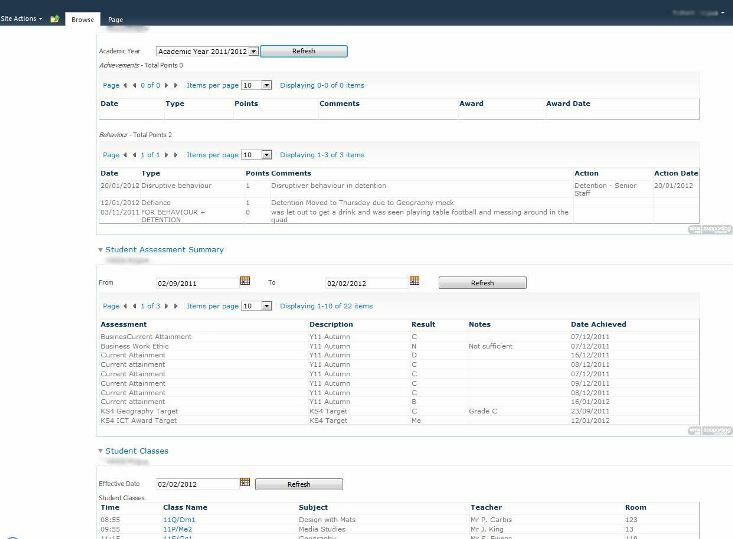 The Student Tracking Suite has significantly changed how the school monitors student progress, and enables intervention at an earlier stage where necessary. The data for the Student Tracking Suite is extracted from the MIS server daily by a scheduled script, and written to a custom SQL Server database that resides on the server running SharePoint 2010. The Web Part surfaces the data from the database for the student who is logged in (or for their parent) when they access the page. 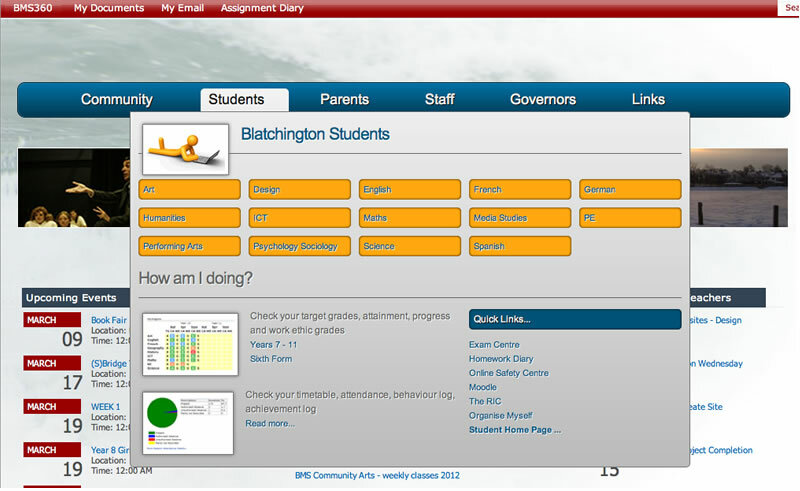 Blatchington Mill School uses the Enterprise version of SharePoint 2010, which includes InfoPath Form Services. These services provide for the design, distribution, completion, and submission of electronic forms. The school is currently replacing paper-based processes for many key areas, including personnel-related requests, internal exam entries, and online registration of student mobile devices for school Wi-Fi access. With the sophisticated workflow management system that is available in SharePoint 2010, the opportunities for replacing paper-based processes throughout the school are significant. Everyone is familiar with the potential value of blogs. At the Blatchington Mill School, one effective use of blogging occurs on school trips. Staff members who accompany the trip upload photos and provide updates and live travel information during the trip. Students can add comments or include messages home. One recent project on the community site of BMS 360 was an exciting visit to Colombia by one of the school staff and a local primary school teacher. The British Council organized the visit with the help and collaboration of several schools around the globe. The Blatchington Mill School staff member used the SharePoint portal as a channel to communicate with everyone involved in the project: the local primary schools, the British Council, and the schools and teachers in South America. Activities included online blog updates, a live video conference, photo and video galleries, and a conference call. The technologies were intentionally very straightforward to show what could be done by using basic equipment and almost no specialist technical knowledge by anyone involved. The Blatchington Mill School provides an all-round system that underpins the work of all staff and students in the school, engages parents, and provides a valuable collaborative environment for students to work with external partners and their community. Instead of simply replacing traditional activities with new technology, the school uses the technology to provide new and exciting opportunities to further student progress and to keep parents actively engaged in their child’s education. At the core is the SharePoint environment, which provides the flexible online framework. From there, the school developed its own customizations to suit its specific requirements.